One of the most serious diseases that can occur to the teeth and gums is periodontal disease. It is a disease that, in the early stages, can be seen as simply swollen red or tender gums, but if left untreated can lead to bone loss in the jaw and ultimately, tooth loss. However, periodontal disease is a preventable and treatable condition and there are ways of cutting the risks of the disease. Preventing periodontal disease starts with your daily dental routine. Regular brushing and flossing will drastically reduce your risk of contracting the infection. Periodontal disease occurs when plaque is allowed to stay on the teeth, if it not brushed away then it will harden to such an extent that only a dentist will be able to remove it. The bi-annual dental visits are imperative in preventing periodontal disease. Many people are unaware that they actual have some form of the disease and only a dentist will be able to detect the early warning signs. 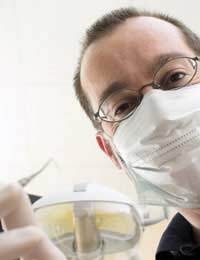 The regular examinations will include a check of the gums for any sign of infection, and a professional cleaning is vital to eradicate any plaque that has built up on the teeth. Although brushing and cleaning will help prevent the disease, you can cut the risk further by eliminating or cutting down on certain lifestyle habits. Saliva in the mouth is needed to combat bacteria, and anything that reduces the flow of saliva will be a contributing factor to the disease. Smokers have a higher risk of contracting the disease because there will be less saliva in the mouth. Smokers also have a lower immune system than non-smokers, and the immune system is needed to combat bacteria throughout the body and in the mouth. It is thought that smokers are around three times more likely to contract periodontal disease than non-smokers. Eating a healthy, well balanced diet will also go a long way in preventing periodontal disease. The infection starts due to bacteria attacking the teeth and gums, so cutting out, or limiting, the number of sugary snacks, fizzy drinks, and carbohydrate food types will go a long way towards cutting the risk of infection. It is not just the food that we eat but also the amount of time that the food is left sitting on the teeth and between the gums. In an ideal world we would clean our teeth every time we had a meal, but busy lives means that the dental routine is sometimes forgotten. The longer food is allowed to stay on the teeth the longer the acids can attack the teeth and gums. If you cannot brush your teeth after each meal then try chewing sugarless gum in order to promote saliva flow. Although brushing and flossing of the teeth goes a long way towards reducing the risk of periodontal disease, it cannot completely eradicate the risk for some people. All of the above factors should be taken into consideration. Although the disease is not as common as tooth decay, it still affects a vast quantity of people and these simple prevention methods may save a lot of trouble, and expense, in the long run. Does Dental Chewing Gum Work?